Using gift certificates is the perfect way to remind patients a gift of your services is something almost anyone would love. If you are committed to building your practice, one way to do that is to make sure that you come to mind when patients are in need of an ideal gift. Here are a few tips to get the most out of your gift certificates. How do you plan on promoting them in your practice? Will you have a stack of them on your desk? Will you tell every patient you have these available? Will you send off an email to all your patients letting them know that you have them available? Think about what “special” thing you are promoting. A bring your friend for an acupuncture Spa Day? A discount on herbs or other products? The headline – Once you know what you want to say, start to think about an attention-getting headline. Whether it’s an email, postcard or announcement on your website, poster in your practice, it should be brief and to the point. Gift Certificate Special From [Your Clinic]! Gift Certificates Now Available From [Your Clinic]! Bonus Services With Gift Certificate Purchase! Exciting news! We now offer Gift Certificates at [Your Clinic]! Does someone you know deserve the gift of a stress-free, anxiety-eliminating treatment? No time to shop? The folks at [Your Clinic] have you covered! Don’t know what to give that special person/family member/coworker in your life? Is there a person/family member/coworker in your life that can use a little relaxation? It’s easy to buy the gift everybody loves — stress-reduction treatment. Get more relaxation with our new gift certificates. Save money and time with gift certificate packages. Save 10% when you buy gift certificates before [date]. Spring gift certificate packages available. Get your next treatment half-off when you bring a family member/coworker/friend in for a stress-reduction treatment. Send a gift certificate to a family member/coworker/friend with one call or email to my office. Buy before [Date] and get an extra 10 percent off your next herbal prescription! 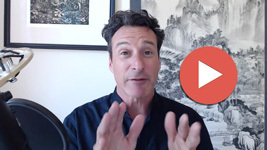 Put them all together — the headline, the offer and the call-to-action. Send a postcard or email, put a poster on your wall, have them on your desk or link it on your website. 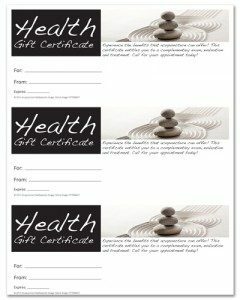 Your patients will get the message that your gift certificates are easy to give — and much appreciated!